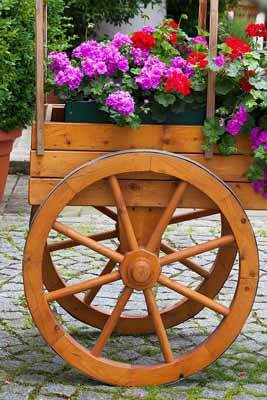 Wagon wheels alone or on small wagons or carts create a beautiful, classic look when used in the yard as decor or art. They can be used by themselves, grouped with other wagon wheels, or as part of decorative planters or other items for the yard. Below is wagon wheel yard decor for sale on Amazon and eBay. For good things to know before buying wagon wheels or yard decor that includes wagon wheels, please scroll down beneath the items for sale. You might also like: Wagon Wheel Chandeliers For Sale. Below: A wagon wheel planter in a yard. 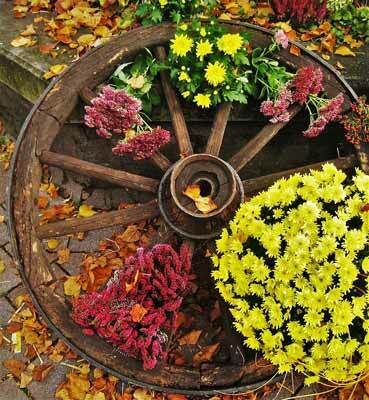 Below: A lone wagon wheel in a yard adding a beautiful accent to a variety of flowers. 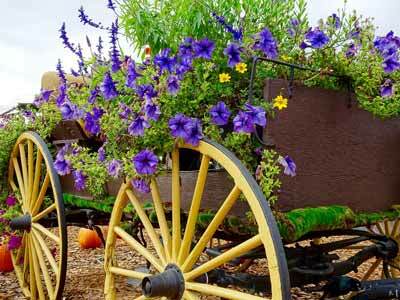 Below are a few good things to know before buying wagon wheels for yard decor or art. If you want a vintage or antique wagon wheel as part of your yard decor that's great, but don't assume all wagon wheels are old. Many of them are new, or possibly used, but still much younger than a wheel from a previous era. In many cases that's good news because they're probably in better condition than their older counterparts, but don't accidentally buy a newer wheel when you were hoping for a genuine antique. What is the wagon wheel made of? Wood and metal wheels are both common alone and/or as part of a larger piece of decor. Is it really designed to be out in the yard? In other words, is it intended to be outside in various weather conditions? Some pieces are actually meant to be used inside to give the interior an attractive, "outdoorsy" feel without being constructed to actually withstand the outdoor elements. Don't accidentally purchase an indoor piece when you really want something for outdoor use. If the wagon wheels are part of an overall piece of yard decor, do the wheels really roll? If so, are they sturdy enough to roll the piece from one area of the yard to another? Do you need to roll it occasionally, or are you fine with putting it in one spot and leaving it? Below: A wagon with brightly painted wheels being used as yard decoration. How big is the wheel or yard decor? Don't just look at the photos to get a sense of size because it can be difficult to get a true perspective on size just by looking at photos. If you're interested in a piece of yard decor that is just a wheel, you will probably want to know its diameter (the measurement across the center of the wheel from one edge to the other). Since the rims of some wagon wheels can be thick, and if it's going to be a tight fit where you plan on placing the wheel you might even want to know the inside diameter (measuring across the center of the wheel from one inside edge to the other inside edge) and/or the outside diameter (measuring across the center of the wheel from one outside edge to the other outside edge). If the wheels are part of a piece of yard decor such as a planter, you will want to know the length, width, and height of the entire piece. Will your wheels and/or yard decor arrive assembled or unassembled? If it's unassembled, does the seller mention what you will need to do to put it together? Will it require any tools, and do you have those tools? Will it require hardware, and, if so, is the hardware included or will you have to purchase it separately? If the wagon wheel yard decor is a planter, is it designed to put dirt and plants directly into it, or it it intended to hold pots? How much does the wagon wheel and/or yard decor weigh? If the wagon wheel yard decor is a planter or something else designed to hold weight, how much weight will it hold? How soon after you make your purchase will your wagon wheel yard decor be shipped? What shipping method will the seller use? 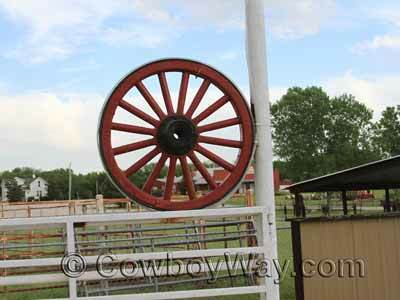 Below: A single wagon wheel at the pipe entryway to a ranch.